MARDI GRAS PARTY AT HAROLD'S CORRAL! 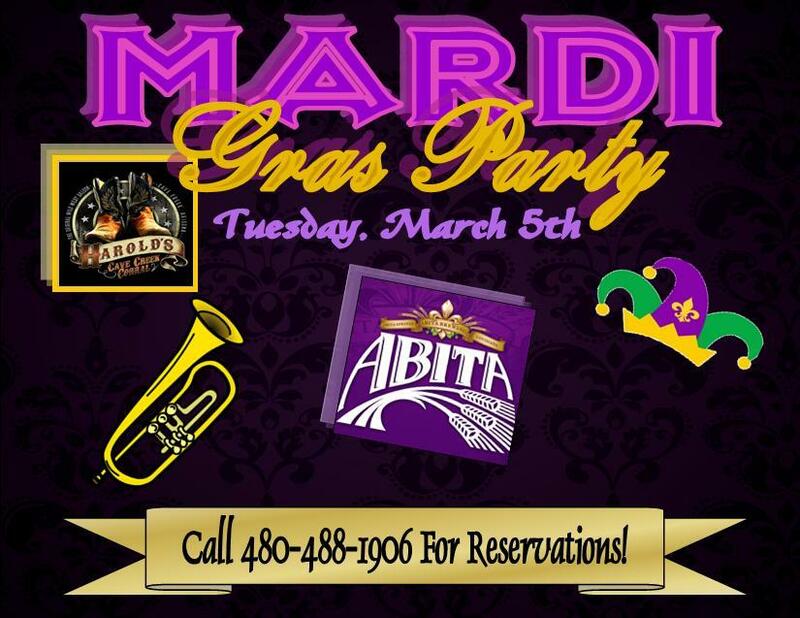 Join us on Fat Tuesday, March 5th for a real Mardi Gras experience! Live Jazz band at 6pm, Swing Dance lessons at 6:30pm, and Acoustic Kings after at 8:30pm! CONTESTS: Costume Contest! Best Mask, Best Costume, Best Face Paint, Starts at 8pm. Most Beads Award! Tops Must Stay on To Earn Beads!!! Crawfish Eating Contest! Sign up at front desk! Contest start at 8:30pm! $18.99 Authentic Mardi Gras Buffet! Includes crawfish, oysters, jambalaya, chicken gumbo, shrimp étouffée, and much more! Call 480-488-1906 for reservations!